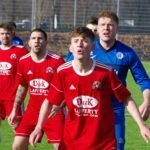 Oban Saints and Rothie Rovers from Aberdeenshire kept a large crowd at Glencruitten richly entertained on Saturday in a Scottish Amateur Cup fifth round replay which ultimately required a penalty shoot-out to decide the winner. After a goal a piece in the 90 minutes, followed by the same again in extra time, it was Rothie goalkeeper Lewis Milne who emerged the hero by saving two Saints penalties to give his side a 9-8 shoot-out victory and clinch a place in the last 16. Saints made three changes to the starting 11 from the previous week’s draw in Rothienorman with Ruaridh Horne, Matthew Kelly and Donald Campbell coming in at the expense of Jamie Graham, David Beaton and James Ford, who all dropped to the bench where they had Dougal Graham, Fraser MacFarlane and Shaun MacIver for company. 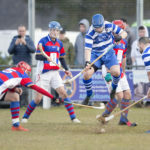 Saints kicked off attacking the railway line end in dull and wet conditions on a Glencruitten surface which had once again been painstakingly prepared by Argyll and Bute Council groundsman Ian Hay. Scott Maitland and Lewis Cameron had some early joy on the left for Saints with Maitland swinging over a dangerous second minute cross which Lewis Milne in the Rothie goal did well to hold under pressure from Craig MacEwan. Three minutes later Milne produced the first of a string of excellent saves, getting down smartly to his right to hold a Lewis Cameron shot after the Saints wide man had beaten Gavin Smart to cut in from the left. Rothie’s main threat was to come from set pieces and a tug on the shirt of Jake Stewart by Craig MacEwan gave the very impressive Rothie skipper Keith Walker the chance to put the ball into the danger area looking for the head of central defender Mark Thomson. Graham Douglas beat the big man in the air to punch to the edge of the box, from where Jack Brown volleyed well over the crossbar. In the 13th minute, Saints carved a way through the solid Rothie defence. However, Donald Campbell’s final ball was too far in front of Matthew Kelly, allowing Lewis Milne to come off his line to gather safely at Kelly’s feet. An 18th-minute Lewis Cameron corner kick from the left found its way through to Donald Campbell at the back post whose cushioned volley back across the face of goal drifted wide of Lewis Milne’s right-hand post. So often Saints’ saviour with the deadball, Willie Gemmell had a chance to make his mark in the 20th minute after Craig MacEwan had been hauled back on the edge of the box. Gemmell beat the Rothie wall but only succeeded in shaving the outside of Lewis Milne’s left-hand post with the keeper rooted to the spot. The Saints pressure was building and they took a deserved lead in the 23rd minute when a Daniel Croarkin shot from 18 yards took a deflection which deceived Lewis Milne and nestled in the bottom corner of the Rothie net. Lewis Cameron will feel he should have done better from a good opening on the half-hour mark but Lewis Milne still required two attempts to save Cameron’s effort from just inside the Rothie box. It was Milne to the rescue once again when he pulled off the save of the match to fingertip over a looping Donald Campbell effort from 18 yards after the Saints co-manager had escaped the close attentions of Gavin Smart and Keith Walker. Rothie skipper Keith Walker went crashing to the ground on the edge of the Saints penalty area anticipating a challenge from opposite number Dene Cassells which never came. Referee Holms, however, was taken in and awarded the visitors a free-kick which Mark Thomson flicked on to Ryan Walker at the back post. Fortunately, Walker’s header lacked the power to seriously test Graham Douglas, who made a routine catch. Saints survived one final Rothie set piece before the interval with Dene Cassells making a decisive clearing header from a Keith Walker left wing corner which Steven MacLeod had conceded under pressure from Jake Stewart. The visitors started the second half in determined mood and enjoyed a good spell of pressure, keeping Saints pinned back in their own half for the opening five minutes. Saints weathered the Rothie storm and got back on the front foot with Donald Campbell and Lewis Cameron both narrowly failing to find Craig MacEwan with crosses from the left. Craig MacEwan passed up a gilt-edged chance on the hour mark, sending a header straight down the throat of the Rothie keeper after a good give and go on the right with Ruaridh Horne. Five minutes later, the Saints’ defence was finally breached from a Rothie set piece when Mark Thomson bundled home a Keith Walker corner kick from the left. 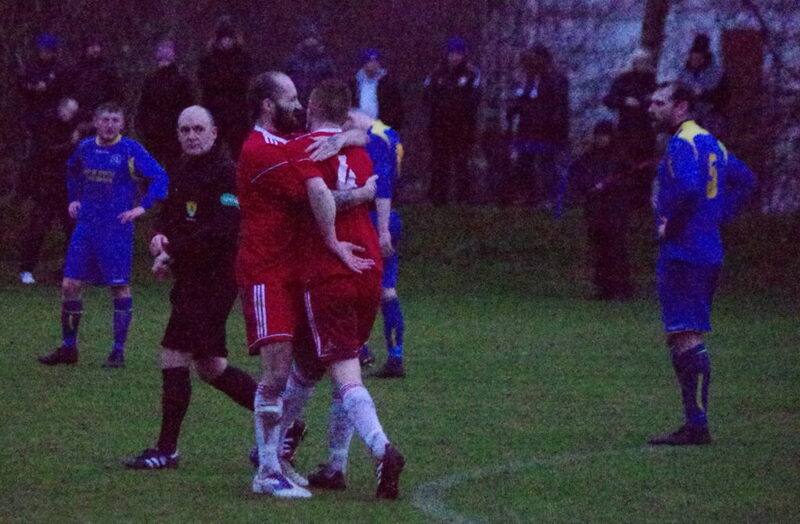 The Rothie goalscorer picked up a yellow card shortly after for an over-the-ball challenge on Craig MacEwan. 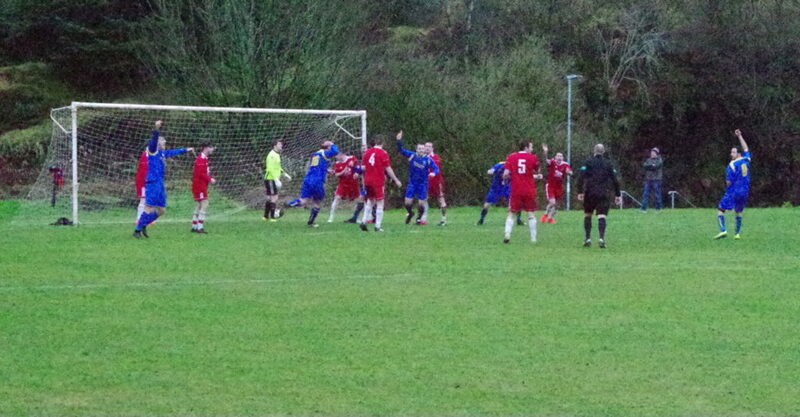 From the resulting free-kick Lewis Milne saved with his feet to deny Donald Campbell from close range after a Craig MacEwan cutback from the left. Saints kept pressing for the winner and introduced James Ford in the 84th minute at the expense of Daniel Croarkin to boost their attacking options. Despite having all of the late pressure, Saints struggled to breach the well-organised Rothie defence and when they eventually did in time added on for stoppages they were again denied by the feet of Lewis Milne, who blocked two pointblank Saints’ shots to send the tie into extra time. In the fourth of the extra 30 minutes, Scott Maitland was tripped as he attempted to burst into the Rothie box. Mr Holms ruled the offence had taken place outside the box, awarding Saints a free-kick which could not possibly have been any closer to being on the line. Willie Gemmell’s delivery was headed behind for a corner kick on the right from which Craig MacEwan rose well but sent his header narrowly wide of the junction of post and bar. Sixty seconds later Saints were again undone from a set piece, much to the delight of the large travelling support. A long straight free-kick from Keith Walker was flicked on by Grant Ritchie to Ryan Walker, who volleyed past the helpless Graham Douglas to give Rothie the lead. The interval arrived with Rothie still holding on to their slender advantage and Saints pushing Dene Cassells into attack and adding Shaun MacIver in place of Matthew Kelly. The second half continued in the same vein with Saints pushing for the equaliser and Rothie defending doggedly. There was a loud appeal for a penalty kick from Saints in the 23rd minute when a Lewis Cameron cross from the right struck a defender’s hand. However, Mr Holms remained unmoved. With two minutes remaining, Shaun MacIver struck the outside of Lewis Milne’s right-hand post after an almighty goalmouth scramble from a Willie Gemmell throw-in from the left. With 60 seconds of extra time remaining, Donald Campbell spun away from his marker and was felled in the box for what appeared to be a stonewall penalty kick. To the bemusement of all, Mr Holms bizarrely pointed the other way and issued a second yellow card to Campbell for simulation, ending the Saints co-manager’s involvement in the game. Despite the referee’s apparent error, there can be no excuse for the foul and abusive language which followed from Shaun MacIver which earned the Saints substitute a straight red card. Neither can there be any excuse for MacIver’s reaction to his dismissal which may yet have further repercussions for the hot-headed young striker. Spurred on by a deep sense of injustice, the nine men miraculously drew level deep into time added on for stoppages. A straight ball over the top from Jamie Graham was glanced by Dene Cassells beyond the advancing keeper and into the top corner sparking wild celebrations among the home support. 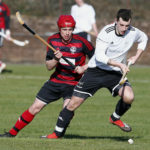 Dougal Graham made the briefest of substitute appearances replacing Steven MacLeod before the restart from where the ball hadn’t left the centre circle before referee Holms blew for full-time. In rapidly failing light, Mr Holms took the players away from the bulk of the crowd to the railway line end where 10 penalties each would be taken before a winner would emerge. Saints were playing catch up right from the start when Aidan Elrick’s successful kick was followed by a save by Lewis Milne to deny Dene Cassells. Keith Walker and Lewis Cameron netted their efforts before Graham Douglas saved from Sean Bremner, giving Craig MacEwan the chance to level, which he gratefully accepted. Some excellent penalty kicks followed with both goalkeepers also finding the net. 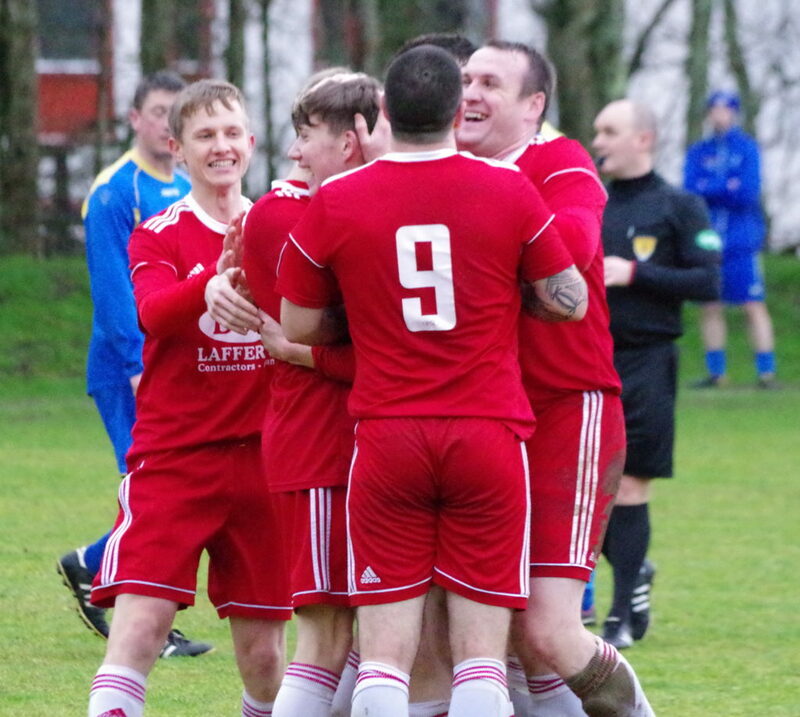 Scorers for Rothie were Andi Bremner, Mark Thomson, Lewis Milne, Scott Chalmers, Grant Ritchie (despite Graham Douglas getting both hands to it), and Ashley Vasey. Successful for Saints were Graham Douglas, Willie Gemmell, Scott Maitland, Dougal Graham, Jamie Graham and James Ford. With Saints only having nine players on the field, it was back to the start where Aidan Elrick repeated his earlier straight down the middle success. Having scored from the spot in the first match, Lewis Cameron was by now taking his third penalty kick of the tie and Lewis Milne finally won the battle of wits guessing correctly and dropping to his right to beat away Cameron’s effort and seal victory for Rothie. The Rovers from Rothie-norman will now travel to Paisley in the sixth round where they will face Alba Thistle of the Scottish Amateur Football League Premier Division on Saturday February 2. Saints will feel this is a tie they should have won. However, they simply didn’t do enough to overcome a hard-working Rothie team who defended resolutely and took full advantage of the few chances which came their way. The Glencruitten faithful are in for another treat this coming Saturday when former Scottish Amateur Football League rivals Thorn Athletic come calling in the West of Scotland Cup fourth round. The Johnstone men are currently eight points clear at the top the Caledonian League Premier Division and will provide a massive test for management duo Donald Campbell and Willie Gemmell and their charges. Kick-off at Glencruitten is 1.30pm with the prospect of extra time and penalty kicks if the two sides cannot be separated after 90 minutes. In charge of proceedings is experienced Central Scottish League referee Michael Kerr.